Accessing Samsung Galaxy Avant's Recent Applications screen and Task Manager is pretty straightforward and just like other Galaxy devices, you can close apps, view apps info, and more. When your phone's performance deteriorates over time, it may be because there are already a lot of apps running in the background that is eating RAM. You need to close them to regain the phone's optimum performance. The following procedures will walk you through accessing the Recent Apps screen and the Task Manager. While on the Recent Apps screen, you can quickly toggle between apps your recently used but only a few actually do this. Owners are used to tapping on the app's icon to open it. In fact, only a few know that you can close apps through the Recent Apps screen. From any screen, tap the Recent Apps key (left of the Home button). The list of applications you recently used will be displayed on the screen. When you touch and hold an app, you will have two choices: Remove from list and App info. Remove from list will close the app while App info will display relevant information about the application including the ability to clear cache, clear data and even uninstall the app. Swiping an app left or right will also close each application. Tapping the Close all icon at the bottom-right of the screen will close all recent apps in one tap. If the Recent Apps screen gives you access to recently used apps, the Task Manager will give you access to all active apps and ability to close them. It is imperative, however, you know how to access the Recent Apps screen because it's there that you can find the link to the Task Manager. With Recent Apps screen open, find the Task Manager icon on the lower-left corner. 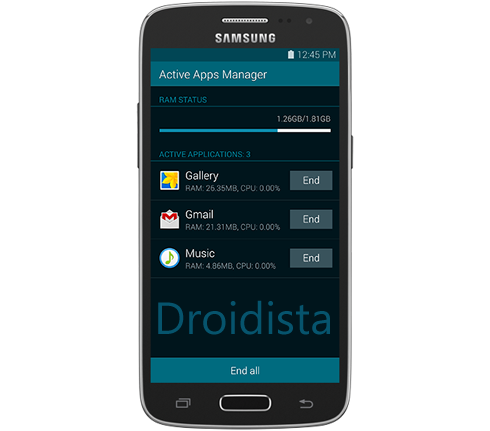 There are two sections in Galaxy Avant's Task Manager; RAM Status and Active Applications. The former will give you an overview of RAM usage while the latter will let you close apps. At the bottom of the screen is the End all button, which will close all active apps in one tap. To close an app, tap on the End button to the right. Knowing how to access both the Recent Apps screen and the Task Manager will help you improve the performance of your Galaxy Avant. I hope this post somehow helped you.